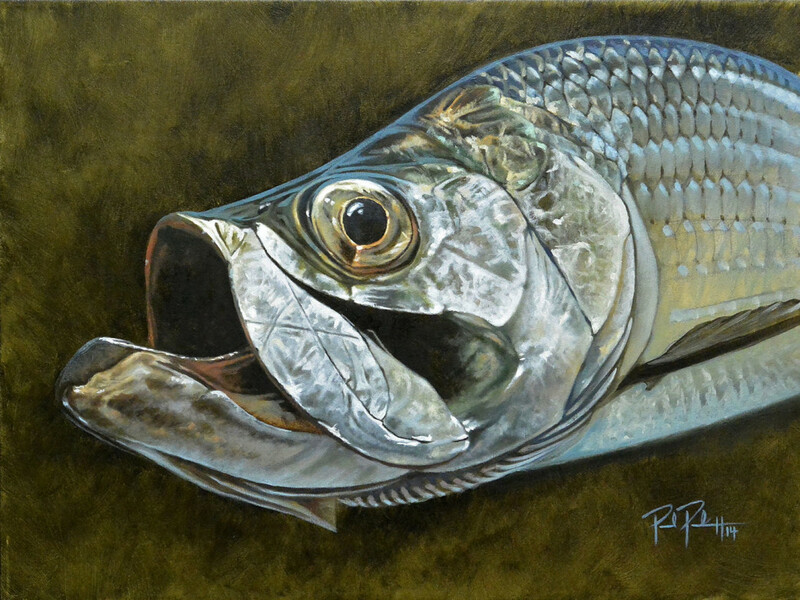 Paul Puckett is a local artist in Charleston, as well as co-founder of Flood Tide Company. 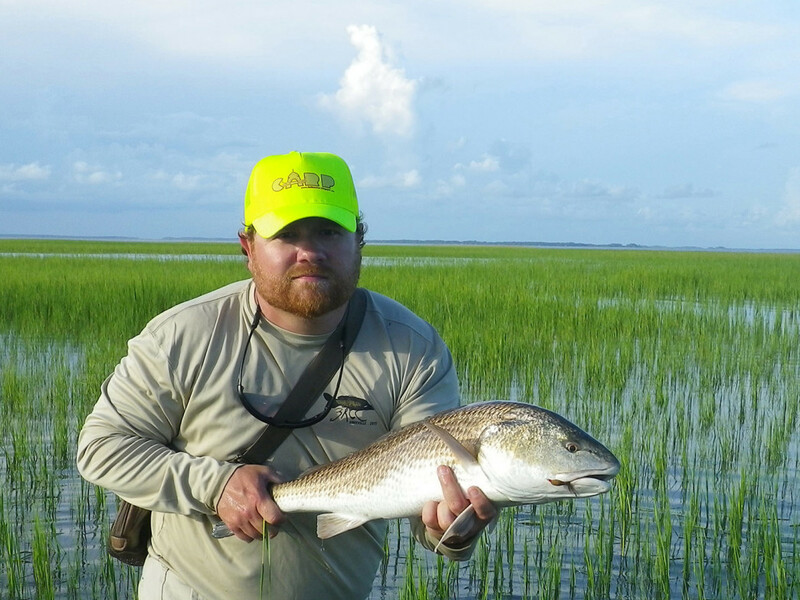 Paul's work has helped to sculpt a brilliant reputation for the low-country fly fishing community, and inspired many to celebrate and protect Charleston's unique landscape. When Paul is not in his studio creating the art that his followers cherish, you can find him up on a stage playing guitar, or cruising for Redfish on the fly around The Holy City. 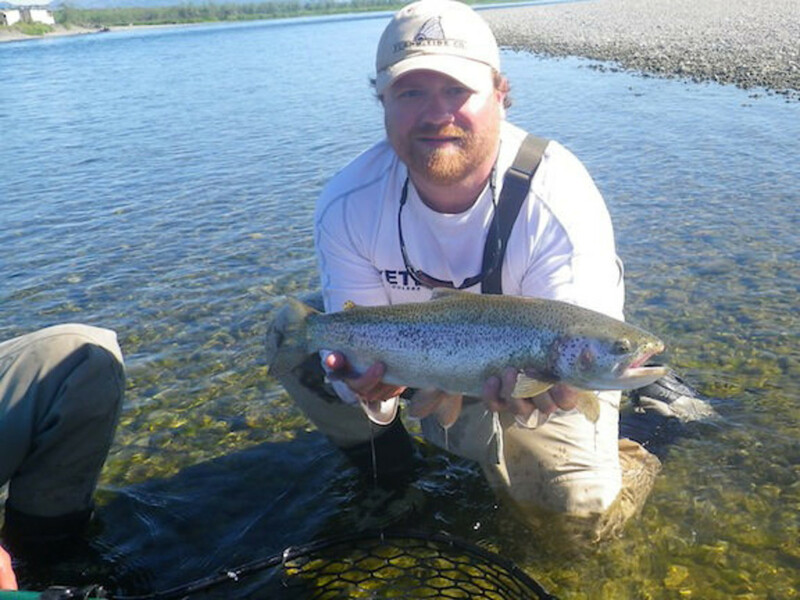 Puckett’s love of fly fishing has lead him to become one of the biggest names in the Charleston outdoor community[LD1] . 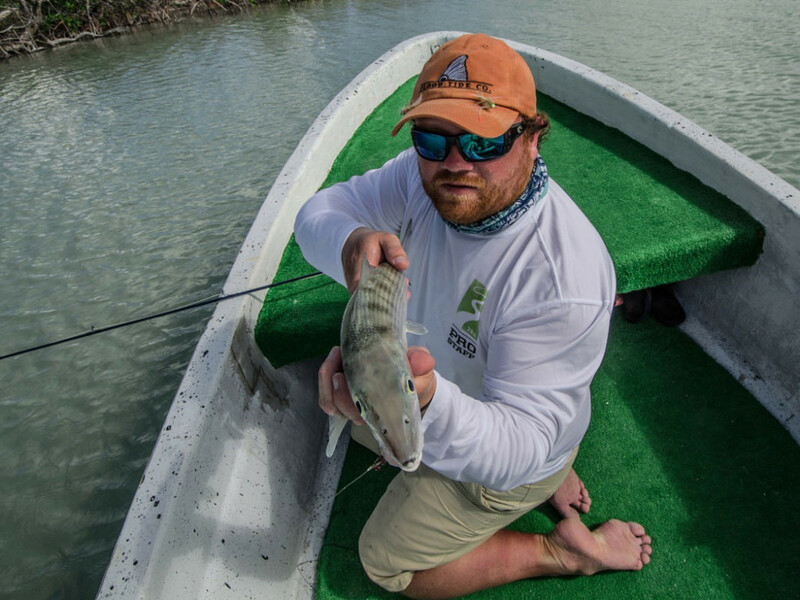 Puckett is also one of the creators of Flood Tide Company, a group of individuals that go out and capture what it means to truly seize the day down here in the low-country. This is the landscape that drives the design behind Paul’s art. 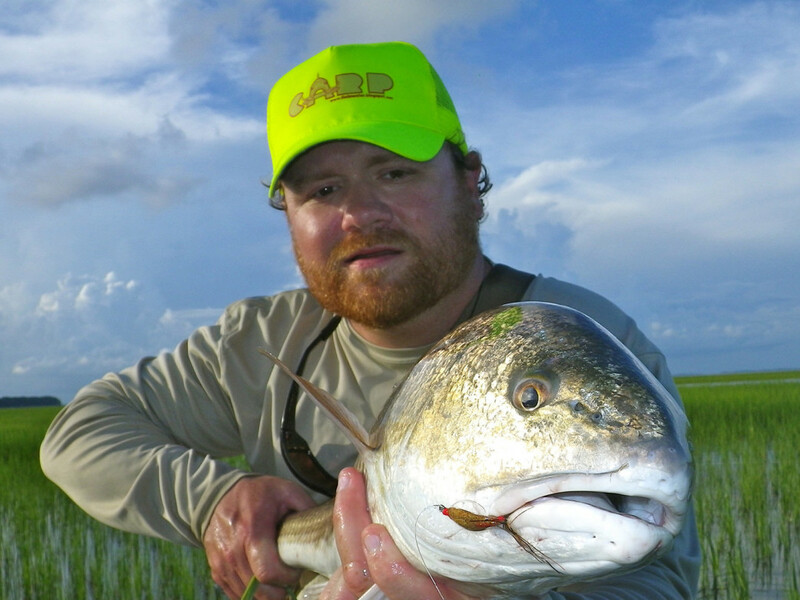 Inspiration can come from a tailing Redfish on the flats, or a school of shrimp jumping out of the water trying to escape said Redfish. It’s no wonder companies and publishers like True Flies Apparel, Southern Culture on the Fly, and Flood Tide are after his designs. 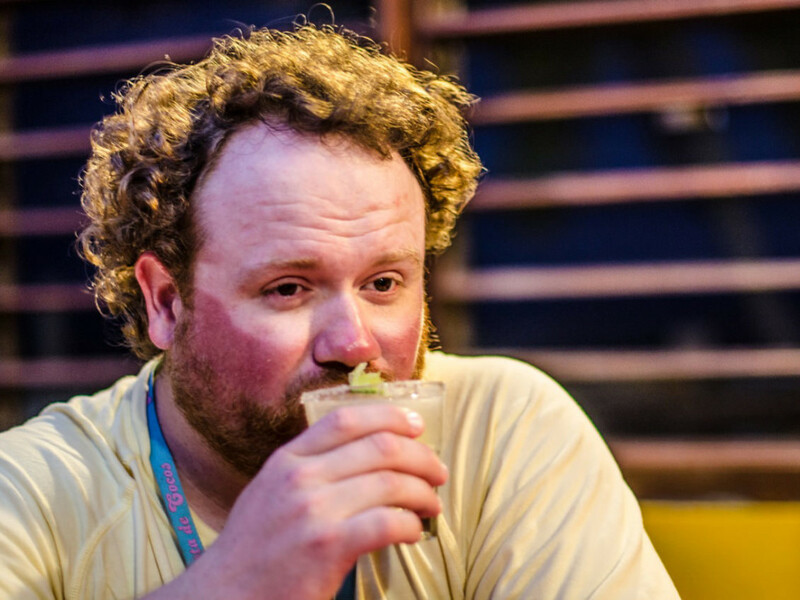 Puckett understands the low country, and captures it through his art. Your art reflects an obsession with fishing, where did the obsession come from? What is your fly fishing background? My granddad was always fly fishing when he was teaching me how to fish, so I was always wondering what he was doing the whole time. He was going to teach me, but passed away before he could. We took my grandmother on a trip to the Ozarks one year and I took all of his gear to try and figure it out. I was out in the middle of the White River and couldn’t even cast 15 feet. That was probably in ‘87 or ‘88 when I was twelve or thirteen. I was addicted. The more I would fail at it the more I had to get back out there. When did you decide to merge your love of fly fishing with your talents as an artist? My first memory of drawing was after I saw the movie ET, I remember seeing that movie and always trying to draw ET as close as I could get to looking like him. High school was when I started to combine my love for fish with my art and I just never stopped. I moved to Atlanta after living in Jackson, Wyoming. A lot of my friends in Jackson started to move here [Charleston] and go to college, so I would come visit a lot, my art was also featured in SEWE [Southeastern Wildlife Exposition] in Charleston[LD3] . I fell in love with the city and after a year of living in Atlanta and driving to Charleston to fish and visit my friends, I decided it was time to move. Artists usually follow a different plan than people with 9-5 careers. What is your routine? I find that I get distracted when I’m home. I don’t really watch TV much, but I have my guitars there, and basically everything that would prevent me from getting to work. So before I set up shop in the studio, I would go to Starbucks or somewhere and work on drawings and logos and then get to work at home around 1. Now I come to the studio in the morning and all of a sudden it’s six o’clock...the time just flies. Once a week myself and the Flood Tide guys will get together, Will from Beaufort and Doug who lives here, and we’ll start to design new patches/shirts, what have you, and take care of business for the week. Then 3 or four days out of the week I work at Lowcountry Fly Shop. 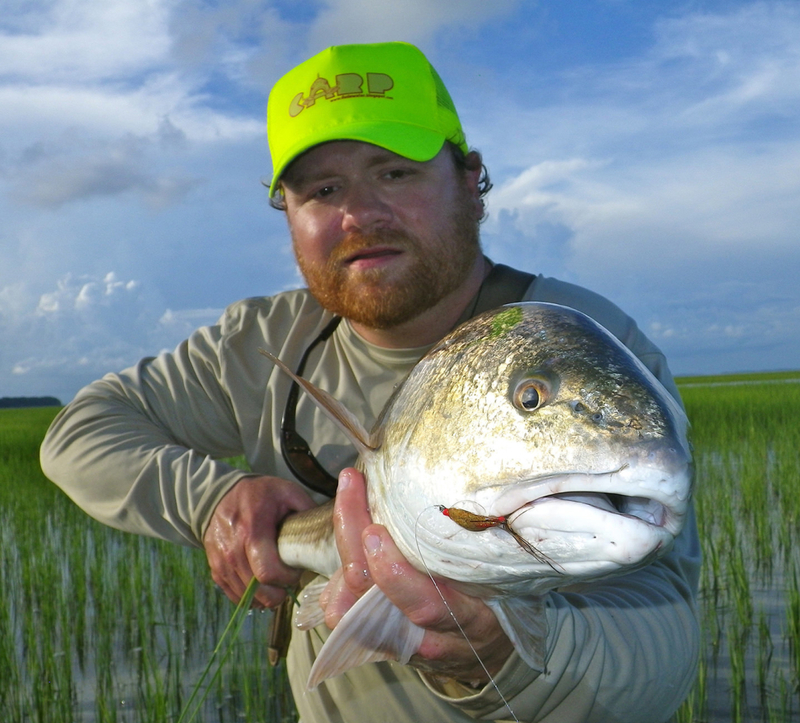 What can you tell me about the fly fishing culture of Charleston? Oh man...it reminds me of how it was in Jackson Hole while I was there. Being in Atlanta the culture was a little stagnant to some degree, but moving here has totally changed my career. Maybe it’s because I met the right people, maybe it’s because there’s a shared feeling that we all want to be consumed by flyfishing. In Atlanta everyone is busy doing their thing, and if they have the time to go fishing they will, but here, the mentality is fishing, then you have to work. It’s totally helped my career because people want to see more of it, and I get sparks of inspiration. What is Flood Tide Co. all about? I was watching Scarface one day while I was doodling and I imagined Al Pacino holding a big brown trout instead of a machine gun. From that came other ideas like that scene in Rocky when he’s running to the top of the stairs with his fists pumping. I imagined him with a trout in his hand. That’s what got the ball rolling. What would you tell someone that wants to do what they love for a living? You’ve got to just go and do it. I think in order to be successful at something you’ve got to put in the time. Whether you’re a writer, painter or a musician. Put in at least 5 years worth of time and see where it takes you. I say absolutely go for it, that’s the only way to make it. There’s no final thing that says “congratulations you’ve done it. It’s an ongoing process. I’ll probably never become a millionaire from doing this, but I will have fun. That’s the main thing. Have fun and go fishin’.